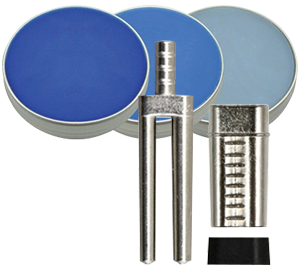 Diamond infused polishers for conventional ceramic materials. Sigma Polishers provide the most efficient solution for contouring, smoothing and polishing all types of conventional ceramic materials. Infused with a high content of diamond grains, these polishers work quickly, and produce an ultra-smooth surface. Technicians are able to achieve an ultra-high luster without the use of pastes or compounds. Coarse Grit (Blue) – quickly shape, contour and adjust contacts. Medium Grit (Red) – smooths the surface and prepares it for final glaze. Fine Grit (Gray) – delivers a high-shine glaze, without using pastes or compounds. Together, technicians can efficiently complete all types of ceramic tasks.